Two people were taken to hospital after a car crashed into a tree following a police pursuit. 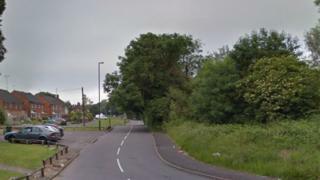 West Midlands Police said the Audi failed to stop for officers on Bunbury Road, Northfield, Birmingham, and shortly afterwards hit a tree on Merritts Brook Lane. A man, 24, and woman, 21, were taken to hospital. Their injuries are not believed to be life-threatening. Officers found a "large quantity" of cannabis inside the car, police said. West Midlands Ambulance Service said crews found the woman lying on the ground near the car, following the crash at about 21:35 BST on Monday. She was treated for serious injuries before being taken to hospital. The man, who was the driver, had been helped out of the vehicle by bystanders. He was treated for multiple injuries and also taken to hospital. The Independent Office for Police Conduct (IOPC) said it has received a referral from West Midlands Police following the crash. "We will carry out an assessment to determine the level of our involvement, if any, in the future," a spokesperson for the police watchdog said.